I believe the likely source of these stains is reversion during the overlap phase. I’m leaning toward this explanation because I suspect these stains were not possible without a chemical and temps elevated way above what we would expect in an intake port. 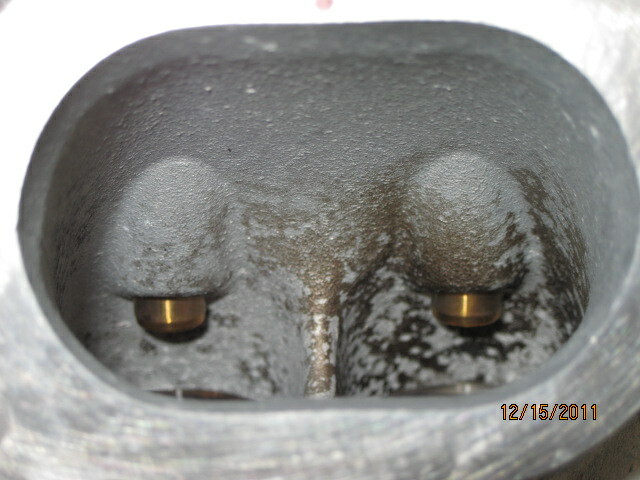 Oil super-heated in the chambers and exhaust moving backward in a state of reversion into the intake ports would meet that description. And the excessive carbon build-up indicates that reversion was a regular occurrence. No surprise given the cavernous and somewhat lifeless shaped intake port. Click here to take a look at the silicon casting. I believe the explanation for why the stains occurred more heavily in one runner than the other is most likely the result of the swirl characteristics within the chamber during the overlap phase, spinning the oil more toward one valve than the other. Considering that the oil is heavier than the exhaust gasses (assuming they contain a limited amount of un-reacted fuel) it’s very possible, if not likely, that the oil would end up unevenly distributed in the back-flow, leading to more intrusion past one valve than it’s neighbor. And it is also possible that the nature of the reversion pushes back through valve more than it’s mate, which would push more oil past the closest intake valve. 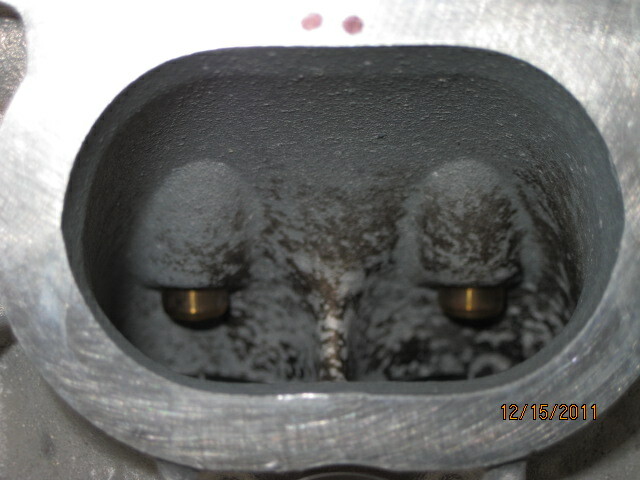 To promote swirl some 4 valve heads are designed with asymmetric flow characteristics in the bifurcated runners. This flow imbalance from runner to runner within the same intake port is often accomplished with physical differences in the individual runners between the bifurcation (where the single port splits into two runners) and the valves. The HondaD16Y8 actually has different size runners from the bifurcation to the valve. 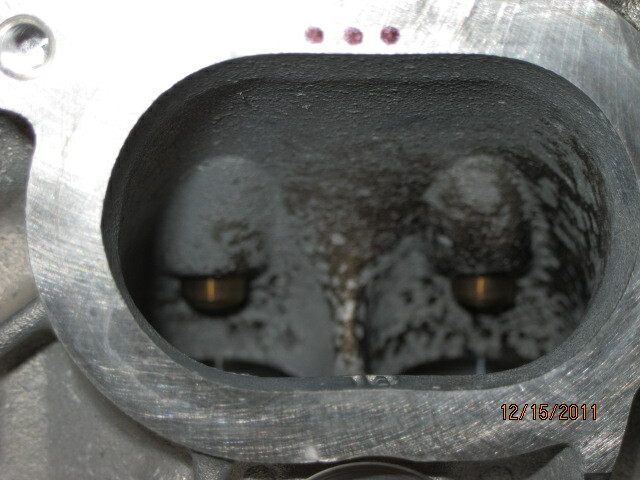 But our silicon 3-D casting allowed us to eliminate port differences. Another possible explanation would be cam lobe profile variations between each cylinders intake valves. This also would produce a flow imbalance that would likely promote swirl. Even though Flat 6 Innovations president Jake Raby and I agree this isn’t terribly likely Flat 6 is going to spin the intake cams in their Audie Tech. Cam Dr. I’ll post the results here when he’s done. But like I said before I think it’s as simple as hot oil moving backward from the exhaust & chambers past the intake valves . We know that a pretty steady flow of oil was getting into the chambers, evident by the very heavy build-up of carbon. After first laying eyes on the heads I expected the intake guides to be worn (And yes, the guide wear from valve to valve was very consistent). 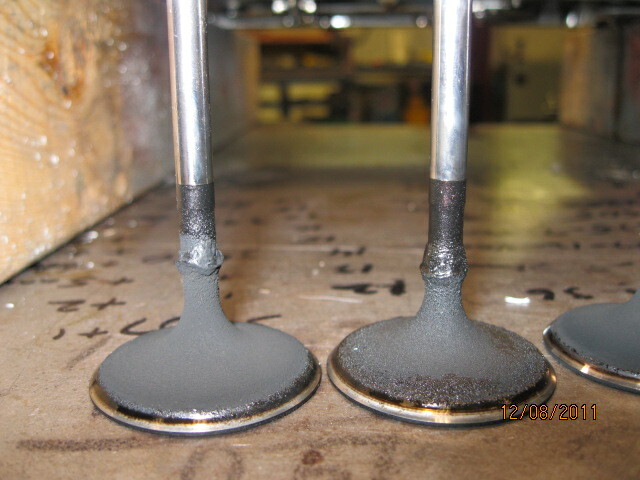 Carbon build-up in the chambers, ports and the backs of the valves was heavy. Check out the photo below. Oil has a very low Octane rating and will flash at a much lower temperature/pressure than the fuel mixture. Reacting oil moving backward into the ports during reversion could explain this pattern. I believe the carbon build-up would not have been so severe if this were not a DFI engine. No fuel in the ports to help keep the area clean. Observation of these patterns and the resulting analysis would not have been very likely without the Ultrasonic process. All of the intake valves had this heavy build up with the peculiar accumulation near the base of the stem.